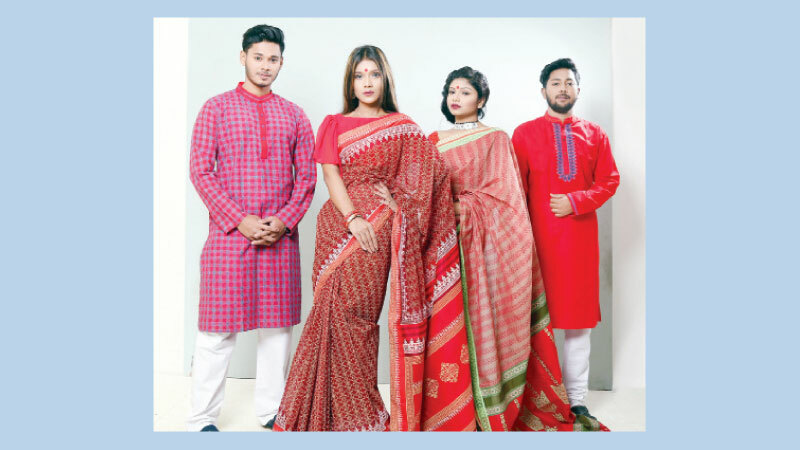 Fashion house Banglar Mela has set the mood of the Bangla New Year 1426 with its splendid Baishakhi collection. The main theme of this year’s Baishakh attire is ‘Mongol Shobhajatra’. For men’s panjabi, jayashree silk, andy, cotton and own-weaved multi-striped khadi materials have been used. These new trendy panjabis will be available in long, medium and short length. Besides, fatuas, shirts and half shirts come up with many variations. Saree has always been one of the biggest attractions of Banglar Mela. Silk, andy, half silk, cotton and Tangail saree are available for this Baishakh. Many designs and variations are there in salwar kamiz zone. Baishakhi collection is available at all 11 branches of Banglar Mela across the country.